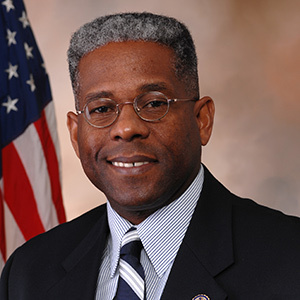 Allen West was born and raised in Atlanta, Georgia in the same neighborhood where Dr. Martin Luther King, Jr. once preached. He is the third of four generations of military servicemen in his family. During his 22 year career in the United States Army, Lieutenant Colonel West served in several combat zones: in Operation Desert Storm, in Operation Iraqi Freedom, where he was a Battalion Commander in the Army’s 4th Infantry Division, and later in Afghanistan. He received many honors including a Bronze Star, three Meritorious Service Medals, three Army Commendation Medals and a Valorous Unit Award. In 1993 he was named the US Army ROTC Instructor of the Year. After his retirement from the Army in 2004, Allen taught high school for a year before returning to Afghanistan as a civilian military adviser to the Afghan army, an assignment he finished in November 2007. In November of 2010, Allen was honored to continue his oath of service to his country when he was elected to the United States Congress, representing Florida’s 22nd District. As a member of the 112th Congress, he sat on the Small Business and Armed Services Committees and was instrumental in passage of the 2012 National Defense Authorization Act. Allen is currently President and CEO of the National Center for Policy Analysis, a 501(c)(3) nonprofit, nonpartisan public policy research organization, established in 1983. Its goal is to develop and promote private, free-market alternatives to government regulation and control, solving problems by relying on the strength of the competitive, entrepreneurial private sector. He is also a Fox News Contributor, a Senior Fellow at the London Center for Policy Research, and regularly writes for numerous media outlets. Allen is an avid distance runner, a Master SCUBA diver and motorcyclist. His wife, Angela, holds an MBA and Ph.D. and is a financial planner. His older daughter, Aubrey, attends college in south Florida, and his younger daughter Austen, is in high school. We prefer email, but feel free to give us a ring anytime for good measure. If you leave a message, we'll make sure to call you back within 24 hours.